Le Blanc Resort has modern architecture and clean lines making it a great Cancun wedding venue. The theme of white makes a nice neutral backdrop to contrast with the blue ocean, and in this case, with the pastel dresses of the lovely bridesmaids. 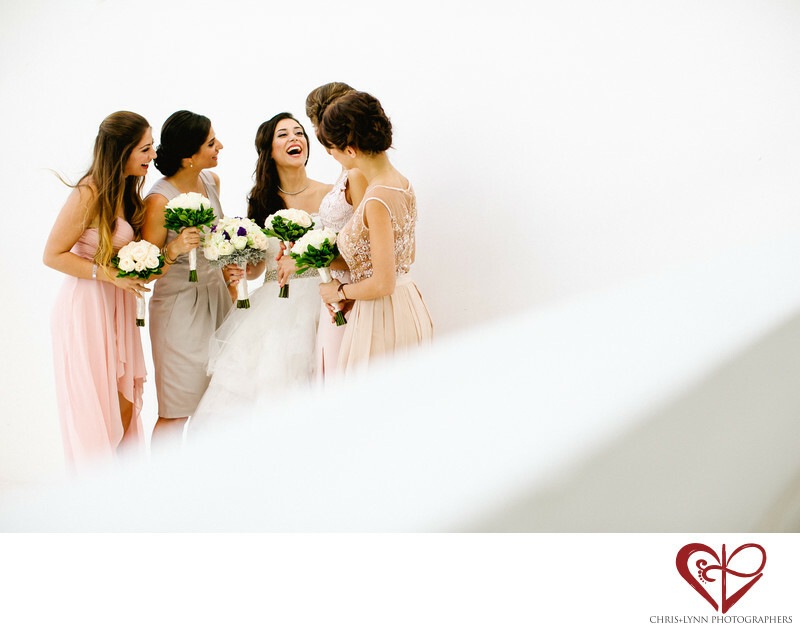 In this bridesmaid photo, the leading line of the railing on the right and the attention of the girls on the bride keep the focus on her joyful expression. A laughing bride is always a beautiful bride! More and more Persian couples from North America are choosing to have a destination wedding. This Canadian couple wanted to escape from the cold and have a more intimate wedding so they chose Cancun as their location and Le Blanc Resort and Spa as their ceremony and reception venue. The bride was concerned that her wedding vendors were familiar with Persian wedding traditions and customs. We had photographed several of their friends' Persian weddings in Vancouver so we came recommended and with the knowledge and experience that was important to her. As destination wedding photographers, our favorite luxury wedding venues in Cancun and the Riviera Maya include Le Blanc Spa Resort, Nizuc Resort & Spa, Rosewood Mayakoba, Fairmont Mayakoba, Banyan Tree Mayakoba, Belmond Maroma Resort, Zoëtry Paraiso de la Bonita Riviera Maya, Viceroy Riviera Maya, Dreams Riviera Cancun Resort, The Ritz-Carlton Cancun, Grand Bahia Principe Tulum, Thompson Playa del Carmen, and the Grand Hyatt Playa del Carmen.